Dig into one amazing strategy game where the player manipulates Eets' emotions and behaviors through the use of food and other props to solve a puzzle. Use prankster whales, exploding superpigs, angry marshmallows and other amazing items to help guide Eets to safety and find his role in a wacky world where nonsense is the rule! 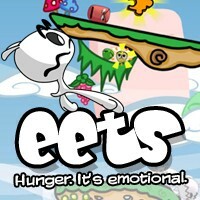 With over 100 levels, trophies to win, and a slew of glowing reviews and awards, Eets is a sure-fire crowd pleaser! query: INSERT INTO accesslog (title, path, url, hostname, uid, timestamp) values('Eets', 'node/1482', '', '3.80.224.52', 0, 1556144945) in /home/surelion/public_html/drupal-4.6/includes/database.mysql.inc on line 66.